BINTANGNEWS.com – Indonesia will never ask for international aid to cope with the devastating impact of Friday's earthquake and tsunami on Central Sulawesi. However, the government would not reject offer of assistance. "Last night, President @jokowi authorized us to accept international help for urgent disaster-response and relief. I am helping to coordinate assistance from private sectors around the world. Please message me at my social media accounts or email: tom@bkpm.go.id," Thomas Lembong, the head of the Investment Coordinating Board, on its Twitter account, @tomlembong, Monday. Coordinating Minister For Law, Security and Political Affairs Wiranto has said the government would accept aid selectively. The comment came as a response to offers from 18 friendly country in the aftermath of Central Sulawesi quake and tsunami. "Selective in accepting aid, and accept aid from selective countries. The mechanism for receiving international assistance is under the coordination of Coordinating Minister for Politics, Law, and Security Wiranto. He said he countries must have the capacity to help Indonesia. Meanwhile, Sutopo Purwo Nugroho, spokesman of the National Disaster Mitigation Agency (BNPB) said that the international aid is limited to air transport service with aircraft that could land on a 2,000 meters runway, tents for refugees, water processing equipment, generator sets, field hospitals and paramedics and fogging. "Though not limited to the six forms of assistance, aid in other forms must be ones urgently needed," he said. Sutopo said learning from the experience in receiving international aid earlier, Indonesia has to be selective in accepting aid, which is urgently needed from countries having the capacity to provide the help. "When worse tsunami hit Aceh (in December 26 in 2004) we had no system, experience and regulation that many countries came with assistance," he said. The Agency and the Foreign Affairs Ministry are currently preparing the mechanism and procedures in line with the existing regulations, he added. However, he said the government will not declare the earthquake and tsunami in Palu and Donggala a national disaster, although the government welcomes foreign aid. 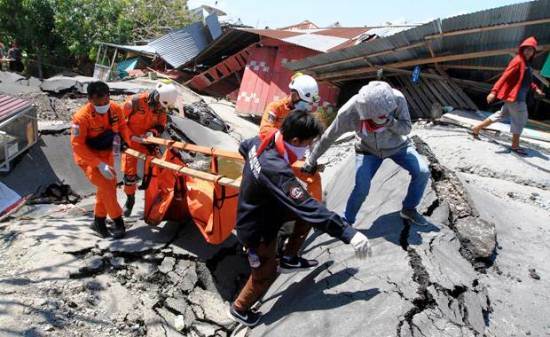 In the meantime, the government has been discussing plans to receive international assistance for recovery efforts in Palu and its surroundings following a devastating earthquake and tsunami, according to Vice President Jusuf Kalla. "It is being discussed," Vice President Kalla stated after attending the DPD RI Anniversary in Parliament Senayan here on Monday. Mechanisms and procedures are being prepared by BNPB (National Disaster Management Agency) and the Ministry of Foreign Affairs, in accordance with the existing regulations, and coordination will later be established with the coordinating minister for politics, law, and security affairs.